Is It Time To Rebrand Your Food Truck? Maybe your food truck business has been rolling around for years and you think your brand strategy is working. But is it? Are your marketing messages and materials driving the results your mobile food empire needs? If not, it might be time to rebrand your food truck. You’ll know it’s time to rebrand your food truck and go back to the marketing drawing board if you can identify any one of the following red flags happening at your food truck. The trick may be to rebrand, adjust your value proposition or simply modify your existing strategy before these danger signs turn into unavoidable catastrophes. Strong brands consistently deliver on their promises to consumers in every brand interaction. Inconsistent messages and visual imagery can confuse consumers, forcing them to turn away from your brand in search of one that does continually meet their expectations. The first sign that it’s time to rebrand your food truck is if your website, truck wrap, ads and marketing materials look like they come from multiple entities, then you need to redesign them so you communicate a consistent brand at all times. Have you determined your one-year and five-year goals? If not, your marketing efforts might not be helping your mobile food business. Take some time to determine your business objectives and then revamp your brand and marketing efforts to help you reach those goals. RELATED: What Is Brand Identity And Does Your Food Truck Have One? You don’t know how to connect with customers. If you don’t know who you need to connect with and where to find them, then you could waste a lot of time building relationships with people and spending time in places that won’t drive the business results you need. Instead, define your target audience and determine what benefits and messages matter to them. Only then can you find where your target audience spends time. Then , connect with them and deliver the kind of valuable information and conversations they want and need. You’re talking only about yourself. It’s important to strike a balance between being social and only self-promoting. Socially, if you talk only about yourself all the time, no one will want to hang out with you. You should take the time to get to know people – in person and on social media sites like Twitter and Facebook and build relationships with them. Cultivate these relationships to help build brand loyalty and advocacy for your food truck. The competition looks better than you. 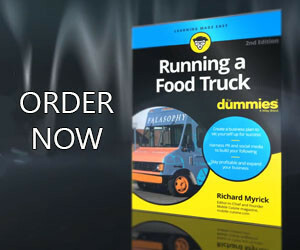 If the other food trucks or restaurants in your area, looks outshine yours then you might need to make a change. The idea is to stay ahead of the curve without copying your competitors’ marketing for the sake of keeping pace. If you don’t look and sound equal to or better than your competitors, then there is no reason for consumers to walk up to your food truck’s service window. Determine what differentiates you from your competitors and what benefits you can deliver to consumers that your competitors cannot. Once you know what those differences are, make sure the world knows them, too through your branding and marketing efforts. While first impressions can be crucial, online consumers can move quickly. If they can’t determine who you are, what you do and how you can help them in three seconds or less, they’ll pass you by. Make sure the first impression you make is clear, concise and quick. Marketing makeovers offer significant opportunities to stay current. It allows you to jump ahead of your competitors, and appeal to wider consumer audiences. Don’t risk alienating your existing customers by rebranding your food truck to make your food truck business and brand unrecognizable to them. In other words, invasive plastic surgery of your brand can do more harm than good. Instead, pursue smaller changes that enhance your food truck’s brand rather than completely reconstructing it.